Double sided gift wrap is unique. Use one side for a birthday and the other for a wedding. This is very convenient, it's like getting two gift wraps for the price of one. Many sizes available, full ream, ½ ream, cutter box and jeweler's rolls. Choose from hundreds of options. 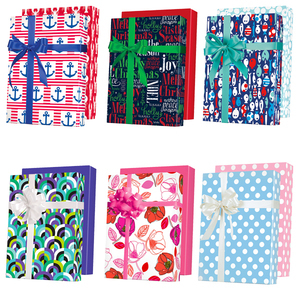 You will find giftwrap from Jillson Roberts, Shamrock, Sullivan and Candy Apple. This gift wrap is produced by Haynesbesco group, founded in 2005. Candy Apple gift wrap is double sided. Choose from 40 different gift wraps for up to 80 patterns. Gift wrap is very thick and hard to tear, this is ideal for gift wrapping.